I think most people who have been stuck in traffic, grinding away on their daily commute up Highway 101 in Mountain View, have casually glanced towards Moffett Field and wondered, “What the heck are those things?” Like me, maybe they remember hearing vague explanations about blimps. Hanger One at Moffett Field is surely a curious feature on the lower Peninsula, a landmark in the distance and a place most Bay Area residents know of but have never had the chance to see up close. The first time I walked into Hanger One I was stunned. You don’t get an idea of the scale of these buildings until you step inside. You start rattling off words like “massive” and “cavernous” and “enormous.” I have a buddy who played baseball inside Hanger One when he was stationed at Moffett for the Navy. He told me nobody ever hit a ball close to reaching the ceiling. Hangar One at Moffet field is “cavernous. 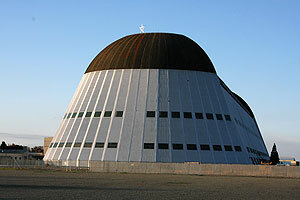 Moffett Field and Hanger One are historic treasures. Now a group is attempting to save the old buildings. If you are curious about the history of this place and want to learn about preservation efforts, I urge you to check out the Moffett Field Historical Society. The gallery alone is worth the effort! NASA has launched its first airborne science mission featuring the Zeppelin NT airship. They have equipped the Zeppelin with two imaging instruments with the hope of learning more about environmental conditions in the San Francisco Bay Area. Today, February 12, 2010 is the 75th anniversary of the loss of the USS Macon. As we reported, the wreckage of the Macon now lies in the Monterrey Bay National Marine Sanctuary. The Office of National Marine Sanctuaries is announcing the wreck site will be added to the National Register of Historic Places. “The first ‘A’ in ‘NASA’ stands for ‘aeronautics,'” said Pete Worden, center director of NASA Ames Research Center in Mountain View. Prev Animal Chefs Next Don't be a "Wasteful Wendy"